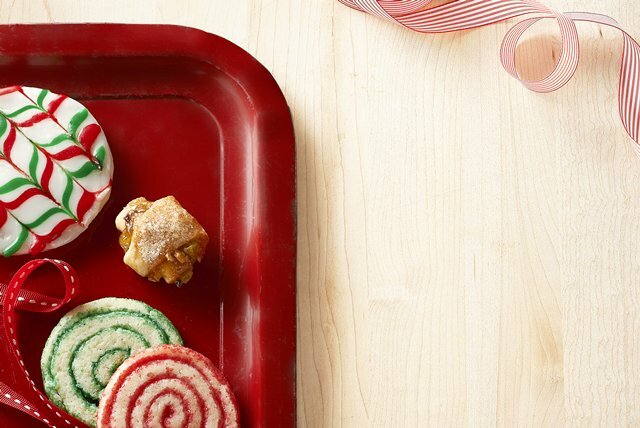 Make the holidays even sweeter with this Festive Cream Cheese Sugar Cookies recipe. Baking cream cheese sugar cookies is a fun activity for the family. Beat first 4 ingredients in large bowl with mixer until blended. Add flour and baking soda; mix well. Refrigerate 3 hours or until chilled. Heat oven to 350°F. Roll out dough to 1/4-inch thickness on lightly floured surface. Cut into desired shapes with 3- to 4-inch cookie cutters, rerolling scraps as needed. Place, 2 inches apart, on baking sheets. Sprinkle cookies with colored sugar before baking. This versatile dough is perfect for your holiday baking since it can be used to make a variety of festive cookies for filling your holiday gift baskets, such as Rugelach Cream Cheese Cookies, Pinwheel Sugar Cookies and Mosaic Glazed Sugar Cookies.